Dogs are well known for being our best friends and faithful lifelong companions. The pug is believed to have originated in China, where it was bred as a companion for ruling families. This tradition continued in the Netherlands in the 16th and 17th centuries after a pug named Pompey saved the life of the Prince of Orange. Pompey alerted the Prince of approaching assassins, and as a result the pug became the official breed of the House of Orange. The breed flourished in the 19th century under Queen Victoria’s reign, and she passed her passion for pugs onto the rest of the Royal family. Pugs remain a popular dog breed to this day, as their charming and gentle personalities make them perfect for young families. Frank was a little ball of happiness! 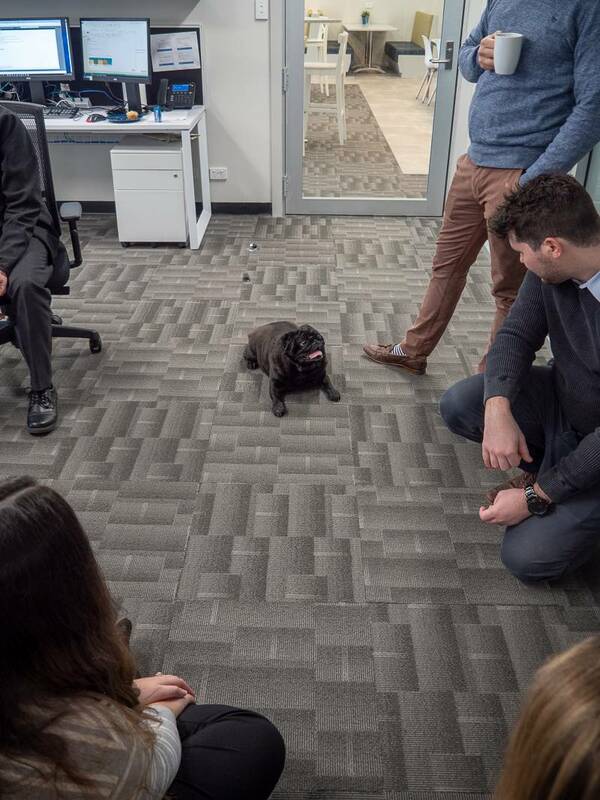 He bounded in on the heels of his owner, Troy, and instantly became friends with everyone in the office. He ran from person to person, getting noticeably more excited with each new friend he made. As he got more excited, he began snorting and wheezing. It got quite loud at one point, so much so that none of us are quite sure how Troy gets any sleep. Frank didn’t leave his Dad’s side the entire time; he even waited at the door for him to come back when he left to get Frank’s treats! 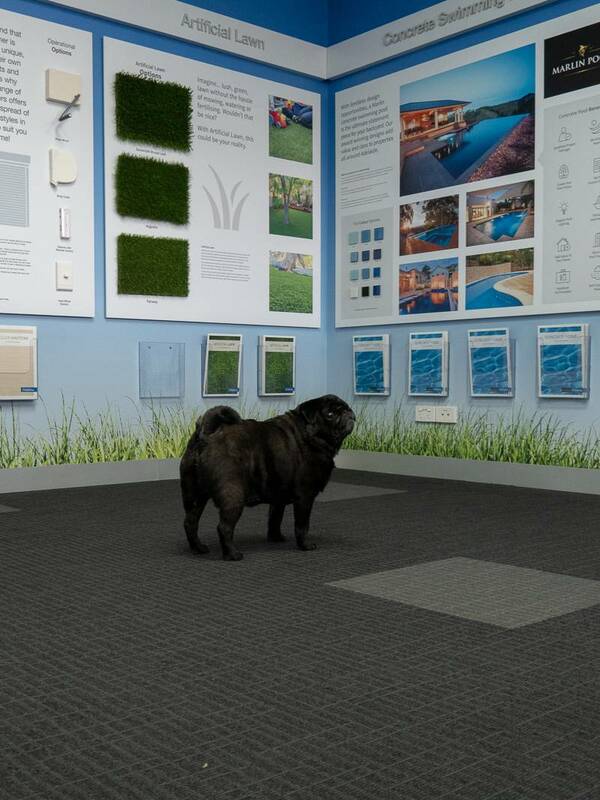 Frank quickly became the centre of attention. Treats? Did someone say treats? Frank loves treats! Frank’s eyes focused on the bag of treats the instant he saw it, and he followed that bag around like it was the only thing in the room. Of course, the playful pug had to take some time out of his day to do a photo shoot, so we grabbed the camera and took off around the office. Frank was more than happy to pose for some photos, especially when striking a pose meant getting a treat! 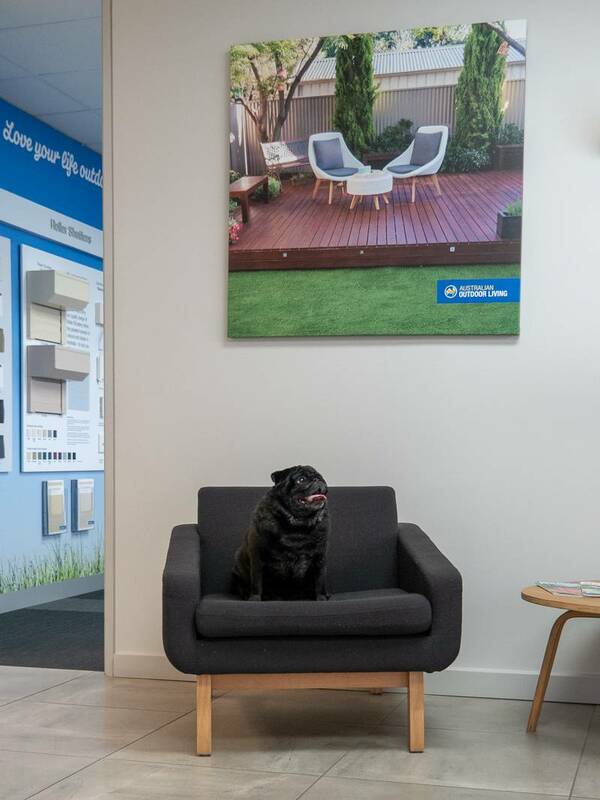 He made his way around our display centre, said hello to all the office staff and then relaxed in a chair in the reception area. Frank could be considered a very lucky dog. According to his owner, he has had a lot issues with his health. “Unfortunately he has had a lot of issues breathing his entire life,” Troy said. According to Troy, they have spent about $17,000 improving the quality of Frank’s life. “He’s worth every cent,” Troy said, smiling. Frank decided he wanted to buy a pool. “I’ve always wanted a pug, so my wife Kimi bought me Frank as a present. He comes from Narara, a small country town in NSW. Black pugs are rare and there is no breeder in SA. “We loved having the little Frankster in to visit us! He is the happiest little boy and would do almost anything for a treat! He is such a character and had the whole marketing team in stitches with his antics. “Frank is an amazing little fellow – so cute with all those folds where his neck should have been. He was big at heart but small in frame! I loved the way he went around endearing himself to everyone. He was noticeably attached to his owner – definitely man’s best friend. “Frank was absolutely tiny, but super cute and loyal. Frank took some time out of his day to relax. Do you have a pug, or a dog that loves being near you?